WASHINGTON, DC – Today, a coalition of organizations supportive of medical marijuana patients and providers (see list of organizations below) are calling on President Obama to withdraw his nomination of Michele Leonhart to serve as administrator of the Drug Enforcement Administration (DEA). Ms. Leonhart, who is currently the DEA’s acting-administrator, has not demonstrated that she is capable of leading the agency in a thoughtful manner at a time when fourteen states have enacted medical marijuana laws and science is increasingly confirming the therapeutic benefits of the substance. Under Leonhart’s leadership, the DEA has staged medical marijuana raids in apparent disregard of Attorney General Eric Holder’s directive to respect state medical marijuana laws. Most recently, DEA agents flouted a pioneering Mendocino County (CA) ordinance to regulate medical marijuana cultivation by raiding the very first grower to register with the sheriff. Joy Greenfield, 69, had paid more than $1,000 for a permit to cultivate 99 plants in a collective garden that had been inspected and approved by the local sheriff. Ms. Leonhart has also demonstrated that she is unable to be objective in carrying out the duties of the administrator as it relates to medical marijuana research. In January 2009, she refused to issue a license to the University of Massachusetts to cultivate marijuana for FDA-approved research, despite a DEA administrative law judge’s ruling that it would be “in the public interest” to issue the license. This single act has blocked privately-funded medical marijuana research in this country. The next DEA administrator will likely influence the outcome of a marijuana rescheduling petition currently before the agency. It is critical that an administrator with an open mind toward science and research is at the helm. Who are the reform groups, we legalizers, suggesting then for the position? What’s former Governor Gary Johnson of New Mexico doing? How about him? He ran as a republican, and hopefully can have some sway with congressional republicans, too. Former Surgeon General Jocelyn Elders? Why not have a doctor instead of a law enforcement bureaucrat? Finally the science could be trump over dogma, and drug use can be dealt with as the medical issue it is, differentiating between use, abuse, addiction, separation of soft drugs from hard drugs and so on along those lines. Abandon the law enforcement supply side economic theory in cannabis prohibition because interdiction to reduce the supply has not significantly reduced demand. Cannabis prohibition simply is not worth the dollars spent on it anymore, and has become a non-priority so the money saved from ending prohibition can be used in places where it is really needed, not some fluff make-you-feel- good Dudley Do Right thing. Great! I wrote both my Senators about her. One of whom, I believe, sits on the committee that will question whoever the nominee is. I pointed them to some of Eric E. Sterling’s writings who links to other’s writings about how she seems to have a too-cozy relationship with one person in particular, an informant who has broken numerous laws, and who seems to often be the SOLE accuser, and who seems to have made at least one million dollars from his questionable accusations of others! Obama, you’d better start backing up your words with actions, unless you’d prefer to be a single-term lame duck! It is NOT ok for things to keep going the way they have for years. Are you planning on having the troops with PTSD returning home, getting jobs in law enforcement and start taking it out on those of us whose “rights” they are supposedly fighting for? I totally agree. Circumventing or completely ignoring state laws to prosecute a witch hunt on U.S. citizens is appalling. The people of these states VOTED on the resolutions to legalize, yet the Federal Government feels that they can ignore the will of the people…sounds familiar, doesn’t it? If anybody thinks the the NIH or any other Federal agency will research the benefits of marijuana objectively without LOTS of pressure from your elected officials you are mistaken. The Feds can hear nothing but their own outdated and scientifically flawed “research”…from over 100 years ago. It’s time that we have MORE research done in the format that the Feds require so we can blow some really big holes (and a LOT of smoke) in their shameless ignorance of facts…besides the fact that they are interfering in a states right to govern itself. Anyone see how marijuana can be classified in the same group as opiates and LSD? Why can the Native Americans enjoy Peyote in rituals but the average American citizen can’t smoke marijuana? How did it ever come down to this insanity? Didn’t Obama tell his people to back off? So if they aren’t listening to their boss, why aren’t they getting the boot and finding work outside of the Federal Government? Time to start writing your letters/emails to your elected Federal officials. Do it with facts, facts and more facts. Don’t rant, don’t give them the ammo they need to call us nut-cases. These dinosaurs need to be let out to pasture. 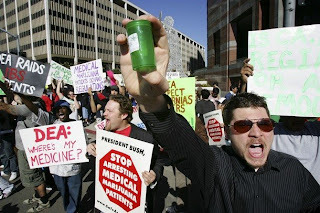 The writing is on the wall… America is tired of the drug war! Hopefully Obama has the right mind to change his nomination, or there is going to be alot of angry people…. This is absolutely ridiculous. Thank you NORML for fighting and keeping us informed. Without you we would continue to be held prisoners to this “war on drugs”. We’ve got a long way to go but have made a few very exciting steps forward in past few months. Lets keep it going until these “trained politicians” can realize this is what Americans want!! All of the change I was so hoping for is not happening. Have always been a strong supporter of Obama but me, like many others are losing faith that he can move us forward, especially since he gave us states rights to medical marijuana essentially and now trying to put someone in there to do the dirty work, while his hands stay clean. Shame on you Obama. Please do not appointment someone that is going to take 4 steps backwards. We need to keep moving forward. Sounds to me like it is about time for another “I have a dream” march on DC!